Helium is extracted from natural gas fields. Numerous impurities are contained in natural gas. The first concentration of helium is made during the extraction of nitrogen. Distillation then allows to remove nitrogen. Different methods are available to extract water from helium. Helium can be purified by cryo-trapping. 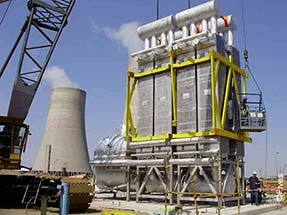 Helium is made by Natural Gas producers, when a positive return on investment can be obtained. The aim is to make added value to the Natural Gas field. The producers distribute the pure helium product (liquefied for transport) to industrial companies and research centers. Used by various industries such as nuclear power, space industry and medical applications, helium is well-known for its qualities in terms of heat transfer, protective atmosphere (as an inert gas) cooling… It is also used in the metallurgical field, for example welding and leak detection. Seven times lighter than air, helium is also known for its use in inflating toy-balloons, in airships and meteorological sounding. What equipment for this application ? 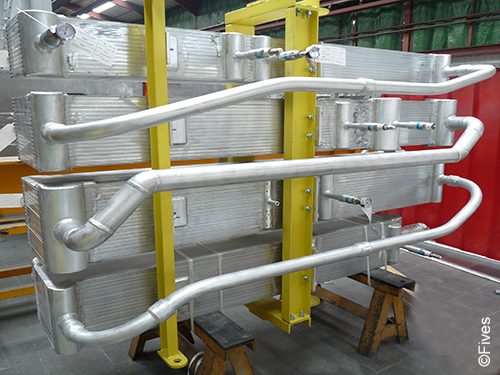 As a component part of helium liquefaction, refrigeration and recovery processes, brazed aluminium plate-fin heat exchangers (BAHX) are installed in vessels under vacuum. They are installed among the release valves, at the center of refrigeration cycles. The BAHX, in a low temperature and high pressure process, are used for helium purification and for separation from the other gases present, via helium gas properties. Since its creation, Fives has developed a trusty relationship with its customers and has participated in major nuclear research programs and industrial projects by supplying Helium or Nitrogen liquefaction heat exchangers for cryoplants. 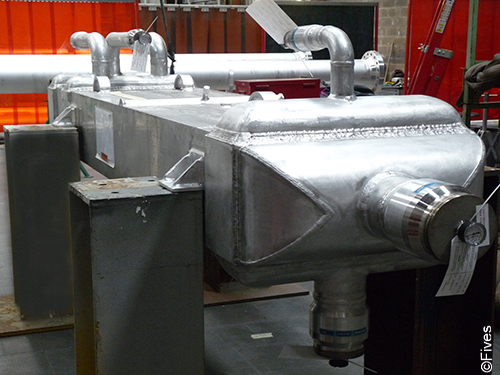 By participating in those projects, Fives has developed expertise in Helium treatment and integrated its particularities for design and manufacture of Helium heat exchangers. 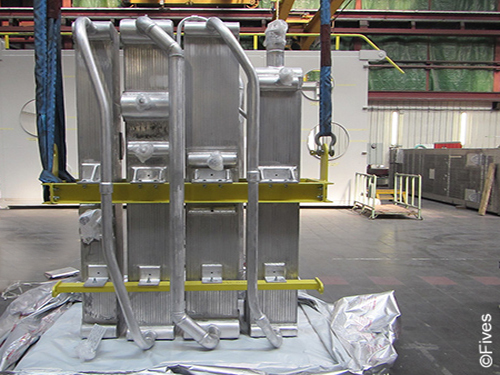 Fives is a leading partner for major worldwide references in helium production, such as the RHEA and JT-60 projects, and recently the ITER project which will be delivered by July 2015. To reach the very low temperatures, the cryoplant of ITER is using Helium fluid with very tight temperature pinch; an uneven flow distribution may affect the thermal performance. It is then crucial to control the flow distribution in order to guarantee the thermal performance of the heat exchanger. Based on its experience on several projects, Fives has developed specific design rules, integrating helium specific behavior, to have homogeneous flow distribution in the core. The exact exchanger configuration is then analyzed and validated with commercial software, from the hydraulic point of view and for pressure drop distribution (per layer and inter layers).